Sophia is the name given to the archetypal feminine aspect of the Divine that has been hidden within Christian tradition. She has been a pervasive, but seldom seen, presence in Christianity until relatively recently. As the long repressed energies of the Feminine have begun to resurface in so many areas of modern life, so too has Sophia begun to emerge from her hiding places in our cultural heritage. 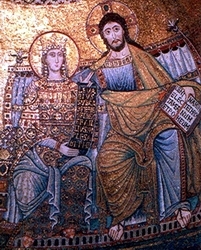 Those who feel called to the task of helping Sophia to re-emerge in our world that is so desperately in need of her, will find that her secrets are more likely to be revealed through Christian art rather than in church dogma or theology. This is because artistic images, as the product of creative expression, are not bound by the straitjackets of rational thought and doctrinal beliefs. Symbolic depictions of the Divine, as attempts to render in form the archetypal energies of the collective unconscious, can reveal truths that even the artist does not consciously understand. So it is that throughout the history of Christianity, where patriarchal biases were codified in Church doctrines and institutions, another spiritual perspective can often be found in the work of Christian artists. Art expresses symbols, which can have many levels of meaning. Therefore, certain elements that might have even been considered “heretical” to the Christian authorities were not recognized as such because of the blinders that were imposed by the patriarchal perspective. But today we can re-examine the art work of Christianity with fresh eyes and see that the Divine Feminine has always been a significant presence in Christian tradition. And the union of the archetypal energies of the Divine Masculine and Feminine, which we call ChristoSophia, has also always been represented in Christianity, especially in its works of art. In our own attempts to discover Sophia as the Divine Feminine complement to Christ, we have found that it is necessary to use our intuition as well as rational thought, and to dig deeply into the same creative wellsprings as the artist. An approach that has been essential to doing this has been to explore the terrains of the visionary imagination in meditation. In this way we can allow the symbols of Sophia to rise through us from the depths of the unconscious. 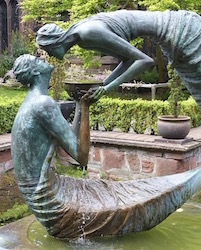 These can then become the impetus for the creation of art, music, and rituals in our own day that will help the Divine Feminine regain her proper place in the world. Another approach that we have also found to be very helpful is the practice of pilgrimage to sacred sites, particularly those where the Divine Feminine has been honored in past times. 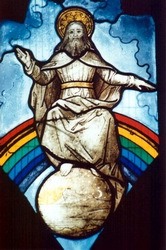 Whether these are ancient pagan sites or churches associated with Celtic Christianity, early Roman Christianity, or Eastern Orthodoxy, we have found that the blessings that we have experienced in symbols and synchronicities at these sites have helped us greatly in our search for the Divine Feminine in Christian tradition. We have found that art, meditation, and pilgrimage experiences resonate together to reveal the depths of the symbolic dimension of the Divine. In our own time this is increasingly manifested as the archetype of a differentiated wholeness, the dynamic balance of masculine and feminine, that we refer to as ChristoSophia in Christian spirituality. 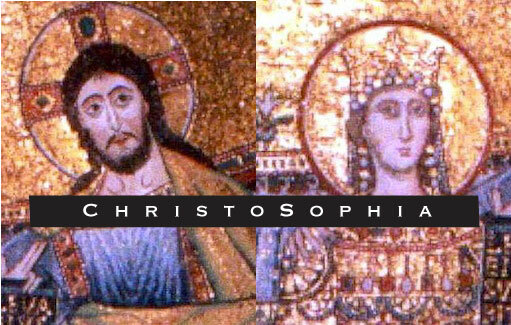 In the following text we have included some examples of where we have found ChristoSophia within Christian art. We hope this will serve as an inspiration in your own search for the Divine.